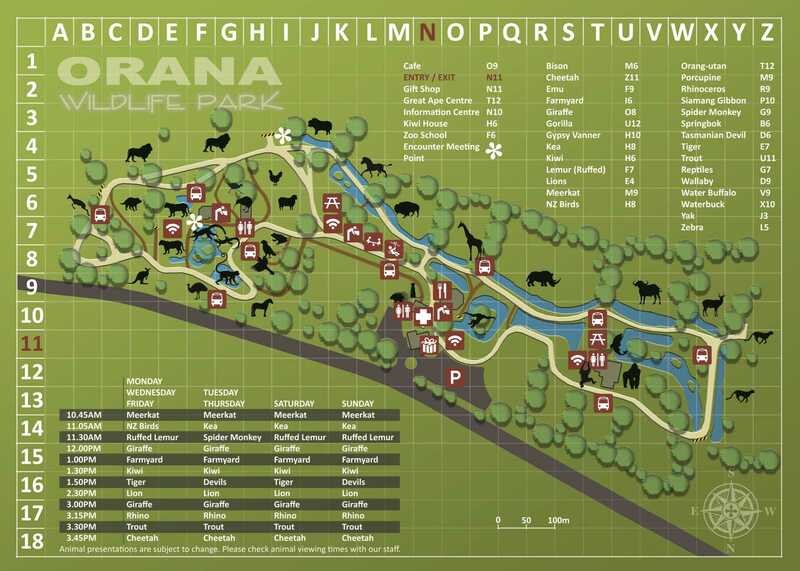 Orana Wildlife Park is set on 80 hectares of land and is home to over 400 animals. The average visit duration is 3-5 hours. To make the most of your Park visit and to optimise viewing opportunities of the animals, we recommend you follow the daily animal presentation schedule. Be sure to catch all the best bits! Check out Orana's must do activities! Ringtailed Lemurs are currently off display due to animal management reasons. We apologise for any disappointment caused. There are twelve daily animal presentations at Orana Wildlife Park, with subtle variations each day. Note that presentation times may be subject to change due to animal management. Animals may not always be fed but a presentation will occur. Have you experienced the world famous Lion Encounter or helped feed our Lemurs? These additional-cost experiences are a unique opportunity and a must-do in Christchurch! Click on the links below for more information and full conditions. Orana Wildlife Park is all about getting up close and personal with the animals. Our trained wildlife guides help to extend the visit experience; they enable you to interact with our people as well as the animals. A range of guided tours are provided daily to enhance the visit experience. Hop on board the complimentary Safari Shuttle for an overview tour of the Park. The shuttle is driven by a wildlife expert who provides a commentary whilst driving a circuit of the Park (a circuit takes around 25 minutes to complete). Check with our staff for frequency of the safari shuttle rides on the day. Alternatively, we offer daily walkabout tours. Visitors can meander around the Park and follow our guides from each animal feed to the next. The guides will ensure you don’t miss a thing and provide a range of intriguing snippets of information for your enjoyment!